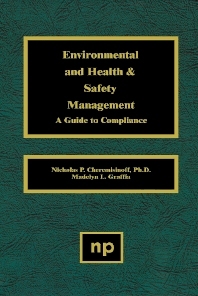 This volume has been prepared for the Environmental and Health & Safety Manager. The EH&S Manager is a new breed of corporate professionals that are faced with the responsibility of handling both environmental policy/issues and occupational safety issues within organizations. Throughout the 1980s there was a proliferation of health and safety departments, environmental compliance personnel, and technical people associated with handling pollution control and waste management. American industry has been over the last several years contracting and downsizing their operations. In doing so, many corporations, large and small, are demanding greater responsibilities be delegated to middle and line function management. In this regard, many corporations today are moving towards a single management entity, the EH&S Manager, who's responsibilities require extensive knowledge of both the environmental statutes and OSHA standards. This desk reference has been written as a compliance source for the EH&S Manager. The authors prefer to call the EH&S Manager an Occupational Safety Professional and use this designation interchangeably throughout the text. This individual, as stated above, has a dual responsibility that requires both technical and managerial skills in two arenas. In this regard, this book provides the working professional a reference on both the environmental regulations and industry safety standards. Additionally, it covers management practices for on-site hazard materials handling operations and constitutes an important reference for establishing hazard communication and training programs for employees. Environmental health and safety managers throughout industry.